It's my goal to try to get our kids to help more around the house. I'm assuming I'm not the only parent facing this never-ending mission. Last night as I left the house to drive to Irish dancing, I asked Reggie to put the towels in the dryer. I reminded Tank to drag the garbage cans and recycling bins in from the curb. They both faked me out by nodding. To further grab their attention, I shouted 'NOW' over my shoulder as I raced out the garage door. 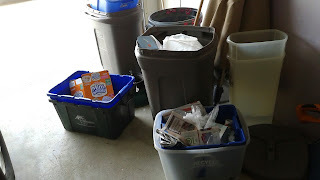 Dragging these bins in from the curb is a chore. Hours later, I stood in my kitchen just in time to hear Coach congratulate Eddie for bringing in the garbage cans . . . NOT. I interrupted him instructing him to direct his sarcasm to Tank, not Eddie. Retrieving garbage cans each Thursday is Tank's job. Just one of many examples why Coach struggles to enforce the kids' chore responsibilities. He doesn't know who is expected to do what on any given day. Reg and Tank were dropped at basketball by Eddie while I was at dancing. The dancing location is far enough from home, I typically wait for class to finish before we head home. After dancing the girls and I booked to the gym to watch the end of Tank's game before finally driving the gang home. On such a splendidly long evening of chauffeuring, I appreciate the kids' ability to pitch in and get SOMETHING DONE. It makes perfect sense that a kid should drag in empty garbage cans so Coach isn't faced with that annoying task after working until after 9 pm. Since Coach actually beat me home, I was dumbfounded to learn that it was Coach and not Tank who handled garbage bin duty. While I stood there processing Tank's epic fail, I turned my attention to Reg. 'Did you put the towels in the dryer?' I quizzed him. 'Oh, I'm going to do that right now,' he mumbled. Damn it all!!!! I was collapsed on the couch when Reggie appeared to say good-night after his shower. Were the towels handled? He nodded. I doubted him. 'What did you do with the stuff that was already in the dryer?' I grilled him. 'Put it in a basket,' he replied. Hmm, good answer. I had my doubt. Maybe he dumped the clean clothes in a basket full of dirty clothes. Coach apparently remembered a prior issue that Reg had loading towels in the dryer. He followed up my question by demanding where the towels came from that Reggie stuck in the dryer. Our 11 year old looked confused. Bad sign. 'Um, from the laundry room floor,' he informed us. Aha! Coach remembered, but I had completely forgotten that a over a month ago Reggie grabbed a few dirty towels from the floor and gave them a good drying. Practice makes perfect, but how many times do we need to dry dirty towels before he catches on? 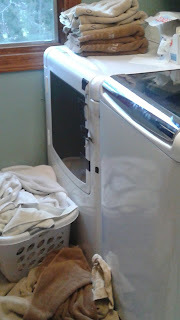 Rarely am I able to squeeze all of our dirty towels into the washing machine in one load. Therefore, there are always a few rogue towels scattered across the laundry room floor. I guess Coach and I are to blame for having a kid who still doesn't understand the concept of washer to dryer to basket. Reggie (4 yrs) in full Bears gear plus pink slippers! 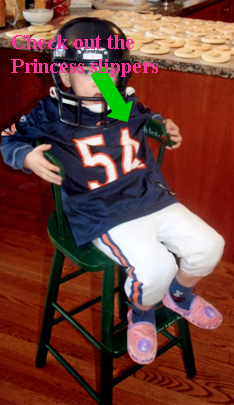 to wearing his favorite Bears jersey. He would stick it in the dryer, but wouldn't turn on the dryer because he was too short to reach the buttons. Then he would ask me if he could wear his jersey. If I responded that he couldn't wear it because it was in the laundry, then he would race to the laundry room, pull the jersey from the dryer, and tell me that it was clean because he 'found it' in the dryer. Many loads of laundry were stalled mid-cycle thanks to his sneaky, I-must-wear-a-jersey trick. I will press onward in my quest to educate this guy on how laundry actually works, although I admit it is tempting to THROW IN THE TOWEL!!!! !